“That is not dead which can eternal lie, and with strange eons even death may die,” declared H.P. Lovecraft describing the truth hidden beneath the surface of his most nightmarish stories. 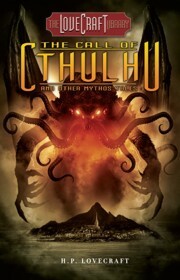 In this collection of six short stories and novellas, Lovecraft explores the boundaries of modern horror, ranging from the cosmic dread of demonic creatures from the stars in “The Call of Cthulhu,” to “The Haunter of the Dark,” and the hidden horrors lurking within “The Shunned House” and “The Diary of Alonzo Typer.” Also includes “The Shadow Over Innsmouth” and “The Festival.” With color art by Sam “Mister-Sam” Shearon and a new introduction by Lovecraft scholar Robert Weinberg. The Lovecraft Library, Volume 2: The Call of Cthulhu and Other Mythos Tales. By H.P. Lovecraft, with an Introduction by Robert Weinberg. New York, NY: IDW Publishing; 2012; ISBN 978-1-61377-209-6; hardcover, 234 pages. This book may be purchased in hardcover from Amazon.com or Barnes & Noble or directly from the publisher, IDW Publishing.